Retired Msgr. Richard T. Kavanagh died on Jan. 20 at St. Paul Hermitage in Beech Grove. He was 98. Msgr. Kavanagh, who died of natural causes, had lived at the Hermitage since 1998. 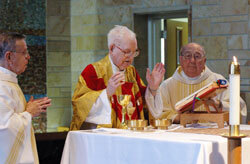 His Mass of Christian Burial was celebrated on Jan. 27 at St. Michael the Archangel Church in Indianapolis. Burial followed at the Priests’ Circle at Calvary Cemetery in Indianapolis. 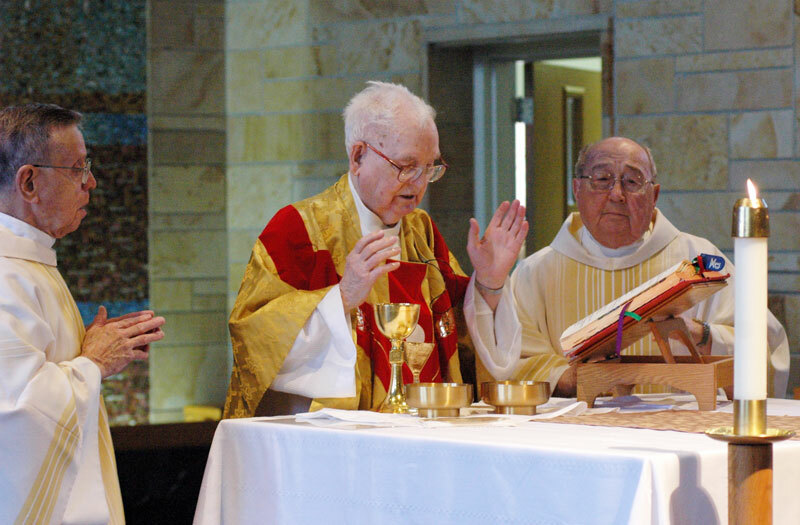 At 73 years, he was the longest serving priest in the history of the Archdiocese of Indianapolis. Msgr. Mark Svarczkopf, pastor of Our Lady of the Greenwood Parish in Greenwood, was the homilist at Msgr. Kavanagh’s funeral Mass. A teenage member of St. Michael the Archangel Parish in Indianapolis when Msgr. Kavanagh was the pastor there, Msgr. Svarczkopf said in an interview with The Criterion that his pastor was instrumental in shaping his vocation to the priesthood. In addition to being administrator and pastor of St. Michael Parish for more than 30 years, Msgr. Kavanagh oversaw projects that did much to shape significant institutions that make up the Archdiocese of Indianapolis today. According to Msgr. Svarczkopf, he was active in the founding of the archdiocesan Catholic Youth Organization in the 1940s and its Camp Rancho Framasa in Brown County. In the years after World War II, he helped oversee the construction of the four interparochial high schools in Indianapolis. Three of those high schools—Cardinal Ritter Jr./Sr. High School, Father Thomas Scecina Memorial High School and Bishop Chatrand High School (now Roncalli High School)—were named after men who were close to Msgr. Kavanagh. He served Mass for and became a seminarian under Bishop Joseph Chartrand. Cardinal Joseph E. Ritter ordained him to the priesthood. And he was a close friend of Father Scecina, who was a military chaplain during World War II and died in the line of duty. Msgr. Kavanagh also established the archdiocesan Office of Purchasing in 1965. And in the early 1980s, as a retired priest, he guided the renovation of the former home of Cathedral High School into the Archbishop O’Meara Catholic Center in downtown Indianapolis. Finally, in the late 1990s, he helped establish the relationship between the archdiocese and the Hermitage that made it easy for retired priests to live there. When asked in a 2006 interview with The Criterion about what was most fulfilling for him in his 70 years as a priest, Msgr. Kavanagh focused on his ministry at St. Michael Parish. Marilyn Bardon was deeply touched by Msgr. Kavanagh’s ministry during his many decades at St. Michael. She joined the parish in 1964 as a 21-year-old and also taught at the parish school. Bardon retired from St. Michael School in 2007. In 1970, her father died unexpectedly and she traveled to Oxford, Ohio, for his funeral. What she didn’t know at the time was that Msgr. Kavanagh and his associate pastor, Father Harold Ripperger, also made the trip. Thirty-eight years later, Bardon’s husband died. And Msgr. Kavanagh, who was 96 at the time, came once again to show his concern for his former parishioner. “I can remember looking up and seeing Msgr. Kavanagh coming into the church [for the wake], being pushed in a wheelchair,” said Bardon in appreciation of Msgr. Kavanagh. Bardon said her former pastor’s presence during her times of grief was emblematic of his concern for each of his parishioners, no matter what big projects he was overseeing either in the parish or the archdiocese at the time. Msgr. Kavanagh extended that concern to his brother priests, even those who were born decades after he was ordained. In the mid-1980’s, Father Anthony Volz, now pastor of Christ the King Parish in Indianapolis, was appointed to the archdiocesan Council of Priests a year or two after his 1985 ordination. He was a bit taken aback when attending one of its meetings for the first time. Richard T. Kavanagh was born on Nov. 28, 1911, in Evansville, Ind., to Thomas and Delia (Fahey) Kavanagh. He attended Mercy Convent and St. Joseph School in Galway, Ireland, and SS. Peter and Paul Cathedral School in Indianapolis before becoming a diocesan seminarian. He received his priestly formation at Saint Meinrad Seminary in St. Meinrad. Bishop Joseph E. Ritter ordained him to the priesthood on June 2, 1936, at the Abbey Church of Our Lady of Einsiedeln in St. Meinrad. Following his ordination, he was assigned for two years of pastoral ministry in the then-Diocese of Denver. From 1938-42, he was the associate pastor of St. Therese of the Infant Jesus (Little Flower) Parish in Indianapolis. From 1940-50, he served in different capacities, including as the assistant superintendent of Cathedral High School in Indianapolis, and the assistant director of charities, where he oversaw the Catholic Youth Organization, United States Organization and Boy Scouts activities. During this time, he served as the administrator of Mary Queen of Peace Parish in Danville, and as associate pastor of Holy Trinity and St. Mary parishes, both in Indianapolis. On Nov. 8, 1951, he was named the administrator of St. Michael the Archangel Parish in Indianapolis. He became the pastor on Feb. 4, 1955, and would remain pastor until he retired in 1982. During the 1960s, he also served as the dean of the Indianapolis North Deanery. In the 1970s, he was the dean of the Indianapolis West Deanery. In 1965, he was named the first director of the archdiocesan purchasing department. Pope Paul VI named him a domestic prelate in 1967. Msgr. Kavanagh retired from active ministry in 1982. Surviving are two nieces and a nephew.